Issam Khoury has been detained, interrogated, beaten and tortured, and forced to flee his country because of his journalism and political activism over the last 15 years in Syria, a country torn apart by revolution and the reprisals of a brutal regime led by Bashar al-Assad. Hundreds of articles, many on freedom and human rights, and two novels that Khoury wrote put him in the radar of al-Assad and his secret police and provoked a series of interrogations throughout the years that ended with his detention in 2012. 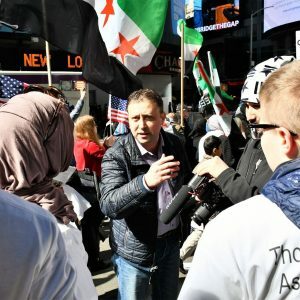 After his release, he spent a year of exile in Lebanon and then secured a visa to the U.S. in New York City, where he served in a major academic post in 2015. Today he runs a non-profit organization that works toward building a civil society in the Middle East and North Africa, and continues to chronicle decades of Syrian misery until the war, where 511,000 have died since the revolution began in March 2011, according to the U.K.-based Syrian Observatory for Human Rights. During that time, Syria also became the most dangerous nation in the world for journalists, with hundreds killed, injured and tortured by al-Assad forces as well as rebel groups, according to the Committee to Protect Journalists. In spite of hazards, international and Syrian citizen journalists continue to risk their lives by reporting on massacres and other atrocities, such as chemical bombings. “If you are not close to people, you can’t understand their pain,” Khoury said in a Skype video interview recently at his office in New York. The 40-year-old Khoury comes from a well-known and educated Christian family in Latakia, a coastal city on the Mediterranean and the fourth largest city in Syria. His activist and writing career began in 2001, and in 2003 he started a non-profit organization called Center for Environmental and Social Development. Through the NGO, Khoury launched many cultural and environmental projects, including cleanups of the coastal area, to promote a civil society in Syria. He emphasized an environmental focus, so he could also address democracy and human rights issues in the region without attracting government scrutiny, and risking jail and the shutting down of the office. In addition to helping many villages become eco-friendly by installing clean energy, Khoury also organized meetings to support women’s rights, trained journalists and citizen journalists secretly inside of Syria, and succeeded in protecting them. Now, the organization has 200 members, including 26 journalists on the field who send information to Khoury for publication. The increasing government crackdowns on journalists and citizens since 2011 occurred despite Syrian law granting them basic rights, such as freedom of expression and the press. Therefore, leaking information was risky, but Khoury’s organization was able to smuggle information by asking female activists to hide USBs in their clothes because the security often did not search women. But these freedoms have a different concept than the U.S.’s First Amendment, because they are regulated by the law. “The state shall guarantee freedom of the press, printing and publishing, the media and its independence in accordance with the law,” Article 43 states. However, the reality of freedom and what people can say in Syria contradict the written laws. ‏‏“This country is hopeless. You can’t work in it,” Khoury said. Khoury’s pessimism is well-founded. Reporters Without Borders published in 2017 that Syria is number 177 in freedom of press in the world and in the past seven years, ranked it “the world’s deadliest country for journalists.” Intense fighting and the forces of many countries and rebel groups involved in the conflict have put journalists and freelancers of both sides under extreme risks. Despite such dangers, for more than a decade, Khoury wrote about different issues in politics and the economy and covered minorities and ethnicities neglected by the regime. He covered the Yazidis, an ethnically Kurdish religious minority, and Alawites, a Muslim minority group and the al-Assad family’s own religious brethren. Amnesty International published a report in 2005 detailing punishment and harassments of Syrian activists. These included more than a dozen of human rights activists, lawyers, journalists, and a teenager and his mother in the early 2000s. Authorities arrested some and banned travel for the rest because of their involvement in human rights organizations and demands for reforms. In 2009, airport secret police seized Khoury’s passport because he had travel restrictions that continued until 2011. Khoury said that after the failure of the 2008 Iranian green movement, Iran trained Syrian security on how they can protect the regime from any revolution. Khoury has a long history and stories “beyond imagination” of interrogations with the General Intelligence Directorate, which summons people by inviting them to “drink coffee.” This is the common phrase used by Syrian authorities instead of saying that they are arresting people to interrogate and jail them. He was summoned by the security branch in Latakia in 2009. He expected to be there for a short time until the interrogation was over, but a military general told Khoury he was going to jail because he had come all the way from Damascus to arrest him. “Imagine my mental state listening to a man threatening me that in a moment I will be prisoned, then after several minutes I’m maneuvering my release and then after minutes the general releases me,” Khoury said. When the Syrian Revolution started in March 15, 2011 in the southern District of Daraa, its sparks quickly reached Latakia. Khoury was of the first journalists to report on what was happening. But the working environment for him at that time became more hostile than it was before, especially in his city, where the government has a strong grip. Ill treatment of journalists intensified when the revolution started, especially in a district such as Latakia, where the old city is a mix of Sunni Muslims and Christians, and the new city with a majority of Alawites. So, during that time, even as a Christian who had become an atheist, Khoury was socially harassed by regime supporters. The harassment was more specific for Alawite and Christian dissidents who were subsequently left with no option but to leave the country, according to Khoury, who believes the government wants the rebels to be exclusively Sunni. Covering demonstrations put Khoury under the spotlight. In 2011, he was captured by secret police who tied his hands in metal chains and attempted to tie them to a car and drag him between Christian villages to send a message to them to stay out of the revolution. People who knew Khoury and saw what happened intervened and stopped the security police. The regime increased its harassments on journalists, which in addition to attacks from many groups involved in the war made it more dangerous for journalists to work in Syria. According to a March 2018 report by The Syrian Journalists Association, journalists are targeted, abducted and killed by the al-Assad regime, its Russian ally, Kurdish groups such as the Democratic Union Party, and groups including Hay’at Tahrir al-Sham and ISIS. In addition, a May 2018 report said that the number of media professionals, including citizen journalists, killed in Syria since mid-March 2011 had risen to 431. In September 2012, Khoury was with his family when the Air Force Intelligence branch in Tartus arrested him. He stayed there for a month in a small cell with other prisoners; the government agents interrogated and brutally tortured him. The detention and torture were harsh for Khoury’s father, wife and young daughters. The intelligence police dragged them out of the car and insulted them while searching for any electronics they might have. With the state’s control of press and absence of international media, citizen journalism was the only way to make the people’s voice heard. Many young men started uploading videos to social media documenting the government’s brutal response to peaceful protests, which is when mainstream media started broadcasting them. Hadi al-Abdullah, a prominent citizen journalist who frequently risked his life covering al-Assad and Russian massacres in Homs, Aleppo and Idlib, and a cameraman were targeted in 2016, according to the Committee to Protect Journalists, which reported that these attacks underline the huge risk Syrian journalists take to do basic reporting. After Khoury’s release, he moved to Lebanon to stay close to Syria and keep reporting. But restrictions on journalists existed also in Lebanon, where Hezbollah has an enormous influence and strong ties with the al-Assad regime. Khoury worked there for a year and a half until 2014, when airport police in Beirut interrogated him and took his passport after he came back from a conference abroad. Khoury then applied for a U.S. visa and came in May 2014 to New York, where he lives today with his family. He was the international journalist in residence in 2015 at City University New York Graduate School of Journalism. Khoury was also a senior advisor for the Middle East and North Africa programs at Strategy XXI, a strategic communications and public affairs organization. He provided solutions in government affairs, advocacy, public policy and crisis communication. Khoury continues freelancing articles about the war and social issues alongside his work as president of the Center for Environmental and Social Development. Khoury’s experience with American journalism and universities was unpleasant. He tried publishing in newspapers, but editors asked him to write for free, but he refused. Khoury also presented to universities several projects that were rejected for lack of funding. The reason he refuses to publish anything for free is his need of a salary to pay journalists inside of Syria who are risking their lives covering the war and need money to live, especially in areas held by terrorist groups such as ISIS, which recruits suffering civilians to work for them in exchange of payments ranging from $100 to $1,000. He said that if European and U.S. newspapers don’t pay journalists, how can journalists help report on the revolution’s costs.